Does your child like music and animals? 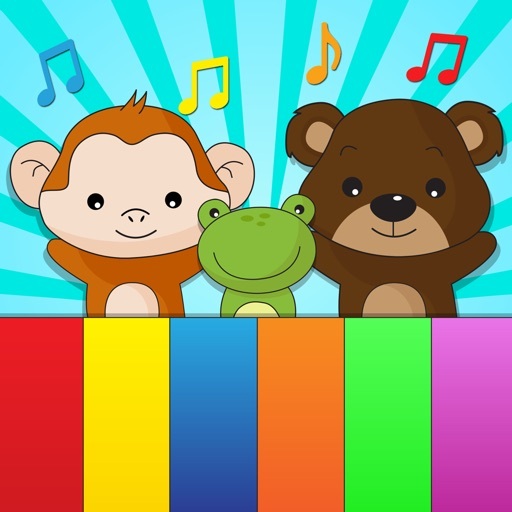 This kids piano app will provide fun and entertainment for your toddler while playing the piano with animal sounds. Play your own favorite song on the piano with real animal sounds or listen to well known nursery rhymes. Babies will also enjoy tapping the different colorful keys on the full screen keyboard on the keyboard and listen to the animal sound effects - a kind of baby music box. - Two different playing modes. For the children, who have fully control on where they touch or tap the screen, the piano is shown along with the buttons for the children songs and animal sounds. 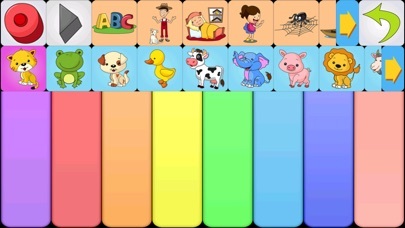 The second mode is a full screen piano which is made for babies or infants who just like to tap the baby piano to hear the funny animal sounds. Please note that the full screen keyboard is only available in the full version. - Nursery rhymes / songs (free version contains 2 songs and the remaining can be purchased in the app). 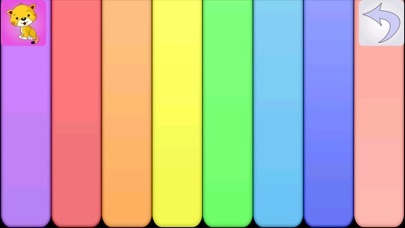 - 8 notes / tones kids piano with bright colors and effects. Multi touch which makes it possible to play several tones at the same time. - -Real animal sound. It’s is not only a cat sound or dog sound piano. This piano app contains 12 different animal sounds. Free version contains cat meow sound and frog croak sound. Full version can be bought through in-app purchase and will unlock animal sounds such as barking dog, moo of the cow, roar of the lion, the bleat of a goat, grunting pig and neigh or whinny of a horse. - full version also contains the possibility to record and play your own songs. It’s great fun for the young ones to play and learn animal sounds on a musical instrument. Playback is only possible within the app. The parents section in this app for kids is restricted by a child lock. In order to access the content relevant to parents or have the possibility of buying the full version the correct sequence of icons has to be pressed. Hopefully, this parental control will give your child a better experience with the app. The magic piano for children may also be used by preschoolers as a first step into the world of musical instruments. It can be used to learn the different animal sounds and get an idea of rhythms in a fun way. Have you ever wondered how the buzzing sound of a fly or the bark of a dog will sound when you play it on a piano? Then try out this animal sound board with animal calls from zoo and farm animals. The sound and touch game is optimized for both phones and tablets and has been tested on toddlers, kids and parents. If you experience any problems with the app or have any ideas on how to improve this kids app please do not hesitate to contact us at http://www.kidstatic.net/contact. You can also go to www.facebook.com/kidstaticapps. Kidstatic apps aims at delivering educational apps and games for toddlers and kids in a simple and intuitive manner. We are continuously expanding the range of themes of learning apps and games for children. If you want to get the latest news about our apps like us on http://www.facebook.com/kidstaticapps or go to http://www.kidstatic.net and sign up for our newsletter.